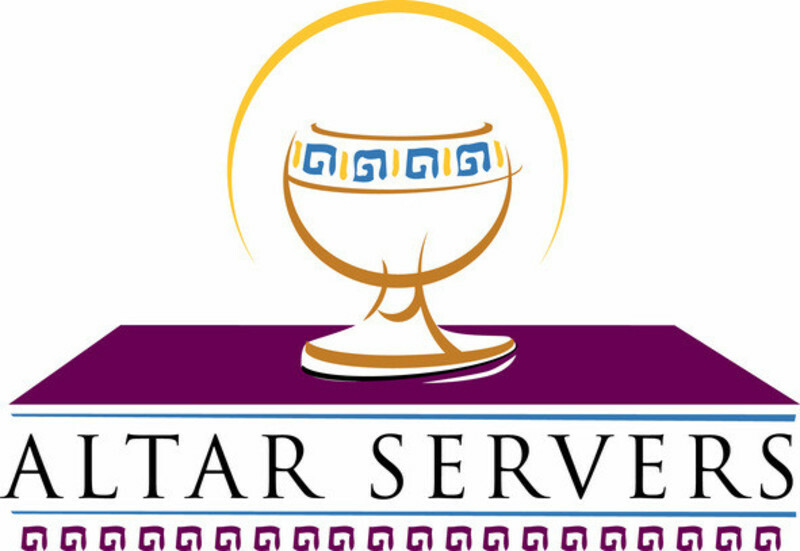 Thank you Alter Servers for your Service to Our Lord and Community. May God's Face Shine Upon you always and your love for God grow ever more. Altar Servers are expected 20 minutes before mass starts. Kindly provide a week in advance notice for finding appropriate substitutes if you will not be able to serve on a particular date. Alb – The full white garment worn by the priest, deacon, and in some cases the altar servers. The alb is symbolic of Baptism. The rope tied around the waist is called a cincture. Altar- The place where the Eucharistic Sacrifice takes place. The altar is sacred and often contains relics of the saints. Ablution Cup - covered dish of water on the side of the tabernacle which is used by the priest, deacon or extraordinary ministers of the Eucharist to wash their fingers after distributing Communion. Ambo - The platform, lectern or pulpit from which the reading and homily are given. Aspergelum – The Holy Water Sprinkler. Cassock - A long tunic like garment which reaches from the neck to the heels which is warn by some servers and clergy. Chalice - A cup of precious metal that holds the wine which becomes the Blood of Jesus after the consecration. All chalices should be placed in their places after Mass. If the Chalices were left unpurified by the priest or deacon for some reason they should be left out on the presentation table for purification by the priest or deacon. Never put an unpurified chalice away. Chalice Veil (peplum) - A cloth covering used to hide the chalice and paten up to the offertory and after Communion. It is selected by the liturgical color for the service. Ciborium - A large cup or container of precious metal with a cover of the same material which will hold the Body of Jesus after the consecration for distribution of Holy Communion to the faithful. Cincture: The Cincture is a cord used to secure the Alb around the waist. It symbolizes the cord that bound Jesus to the pillar while He was scourged and is useful in reminding us to be strong spiritually in the battle against evil. Corporal - A white linen cloth, usually with a cross in the center, used to protect any particles of the Precious Body and Blood of Jesus from falling to the altar cloth. It is always folded and unfolded as to protect any particles from being lost. The corporal is like the body winding sheet used to hold the crucified body or Our Lord in the tomb. Communion Plate or Paten: Flat plate with handle used to catch particles that might fall from the Sacred Host during Communion. Credence Table - The table in the rear of the sanctuary where the cruets, chalices and ciborium are kept before and after the Consecration. Cruets – The vessels containing the water and wine used at Mass. Finger Towel- A towel that Father will use to dry his hands. Flagon or Flask-The large glass decanter that holds the wine at Mass. Holy Water Bucket – is the container used to hold holy water. Lavabo- The pitcher of water used when the priest washes his hands at the end of the offertory and before the Liturgy of the Eucharist. Lectern – is the stand that is sometimes used on the side of the Ambo. It is used by the cantor. Lectionary - The book of reading used for the liturgy of the word. It usually contains all the biblical reading used for the three year Sunday cycle of reading and the two year daily Mass readings. Lunette - A thin, circular receptacle, having a glass face that holds the Consecrated Host used for Adoration and Benediction. It slides into the monstrance on a little track. Monstrance - This is a large, ornate vessel used to hold the Blessed Sacrament for Adoration, Benediction and solemn Eucharistic processions. Offertory Table-The table behind the last pew by the pew break where the gifts are placed. Pall - A square piece of cardboard or plastic which is covered by linen and used to cover the chalice. Pascal Candle/Easter Candle – is the large candle that is located near the baptismal font. Paten - A small saucer shaped plate of precious metal that holds the Host. No lay person should ever touch the paten so be very careful when handling it in your official duties. Purificator - A linen cloth used by the priest or deacon to dry the chalice after washing and purifying it. Used purificators should always be placed in the proper container for sacred cloths. Pyx - A case, about the size of a pocket watch, in which Communion is carried to those who are sick or unable to come to church. Roman Missal - The book containing the prayers said by the priest during the Mass. Sacrarium (piscina) - A sink with it drain going directly into the ground usually fitted with a cover and lock which is used for the disposal of the following: The sacred linen wash and rinse water, used holy water, used baptismal water and blessed ashes. No other use is permitted. Sacristan-The person who takes care of the sacred vessels and vestments used at Mass. Sacristy-The portion of the Church building where the priests, deacons, servers, and lectors meet to vest and prepare themselves for Mass. Sanctuary-The area of the Church that contains the altar and the ambo. Sprinkler (or Aspergill) – is used to spray holy water over the people during a blessing or a sprinkling rite. Stock - The metal containers used to hold the oil of the catechumen, the oil of chrism and the oil for anointing the sick. Stoup - The holy water fountains or bowls at the entrances of the church. Surplice - A wide sleeved, linen worn over a cassock by clergy and altar servers in some parishes. Tabernacle – is the large, decorated box or safe in which the consecrated Eucharistic Bread is kept. It is located in the center of the rear of the sanctuary. Thurifer — The server who handles the incense and boat.